Knitting Looms â€“ Easy To Use. You can lean to knit with knitting looms. Knitting has regained popularity in recent years. Once thought to be for just the older generation, this is not so now, as it is enjoyed by young and old alike. Knitting on looms is far easier than with needles. There are various manufactures who produce them, and can be used by you at home. They are easy to use and help to make this craft interesting. They vary from, plastic looms to the heavy duty wooden looms. Looms that are available in to days market come in various shapes and sizes, these including oval, round and rectangular. There are also ones that you can buy that are shaped like butterfly, this design is helpful in creating knots and crochets. Some manufacturers have made fun filled ones which glow in the dark. You would find them helpful if you wanted to work in a dimly lit room. You can find some really nice Knitting Looms here. 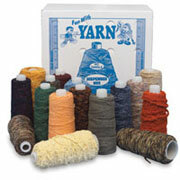 Parents can even get a gift child knitting loom set, to give their children on there birthday. 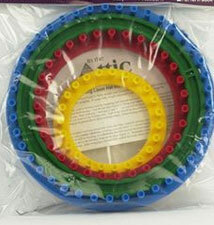 The child set includes a set of four plastic looms, they also come with a full set of instructions for the use of them. All the possible steps are taken for the safety of the children. But it is recommended they are not used by children below 5 years of age. By giving your children a set you can develop a interest in this hobby at an early age. It is also said that knitting is a very good recreational activity, that can be enjoyed by all the family. Round looms can be used to create objects like hats, wrist warmers and so forth. They also come in single rake or double rake, this means it has a single row of pegs or a double row. A single row can be used to create objects with one right side and a wrong side. While the double row is used to create a garment that can be used both ways. Rectangle looms are good for creating scarves, Afghans, and other large projects. This loom has a single rake and it is easy to work with. If you buy a set of these, you will also get a pick and hook tool and the necessary instructions. Knitting looms are a great for every beginner to the world of knitting. The knitters who are unable to, or wish not to knit using needles can use them easily. By using various methods of wrapping the yarn on the pegs, you can create projects of intricate stitches and patterns. Any project you create using a knitting loom, is every bit as good as the ones that are made using needles. So why not get yourself one and with the help of it you can create exquisite projects, in a much faster time and with much less effort. I also found this great video that shows you how to use a loom. It is very informative so check it out.
" This article was written by Gina Williams, an up and coming expert on Knitting. Did you find these tips useful? You can find out a lot more FREE information about this craft by going to http://www.free-knitting-tips.com"